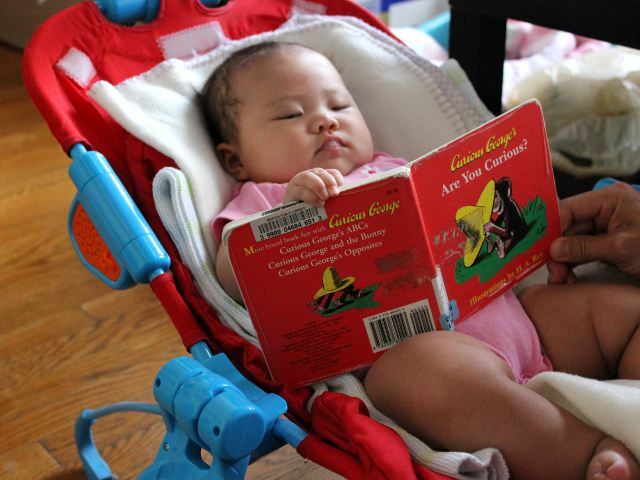 I remember reading Curious George when I was a kid so I couldn’t wait to read his books to Arya. Curious George is an old character, first created in 1941. The pictures used in this Curious George book are taken from original illustrations by the creator of Curious George, Margaret and H.A. Rey. Curious George’s Are You Curious was Arya’s first introduction to the cute monkey and she enjoyed it enough that I will look for more Curious George books to read to her. My baby liked the changing, colorful backgrounds used throughout the book. She also liked looking at different iterations of Curious George himself and kept trying to touch him on the right side of each page. Arya spent the most time looking Curious George being silly. I think she was confused about George being upside down on that page, but she may have also liked the green background contrasting with the brown monkey. The text is well suited for baby readers with only a few words on each page. Frequent ellipses and question marks encourage adult readers to use inflection and tone to convey meaning. The book doesn’t have any particular message, but the fast pace and light-hearted pictures will entertain children until they are old enough to read the text fluently by themselves. Both H.A. and Margaret Rey have long since passed away, but the U.S. publisher of Curious George books — Houghton Mifflin — continuous to produce books based on the couple’s original drawings. The Reys donated their literary works to establish a collection at the University of Southern Mississippi. Curious George’s Are You Curious costs (including shipping) $5.95 new and $3.22 used from Amazon.